Add the water to a small bowl and sprinkle the gelatin on top. Leave aside to allow the gelatin to bloom for at least 5 minutes. The gelatin will absorb the liquid and look like swollen translucent granules. Add the sugar and coconut milk to a saucepan and bring it to a gentle simmer on a medium-low flame. Scoop the dragon fruit pulp into a bowl. Smash the pulp with the prongs of a fork. Add the dragon fruit and rambutan fruit pulps to the coconut milk in the saucepan. Stir in the gelatin and mix for about 1 minute. Pour and evenly divide the liquid into serving bowls or molds and refrigerate until the pudding is soft but firm to touch. This will take at least 4 hours. Serve chilled directly in serving bowls. If using molds, then place the outer surface of the mold in warm water for a few seconds to loosen, flip onto a clean plate, tap gently and remove mold. 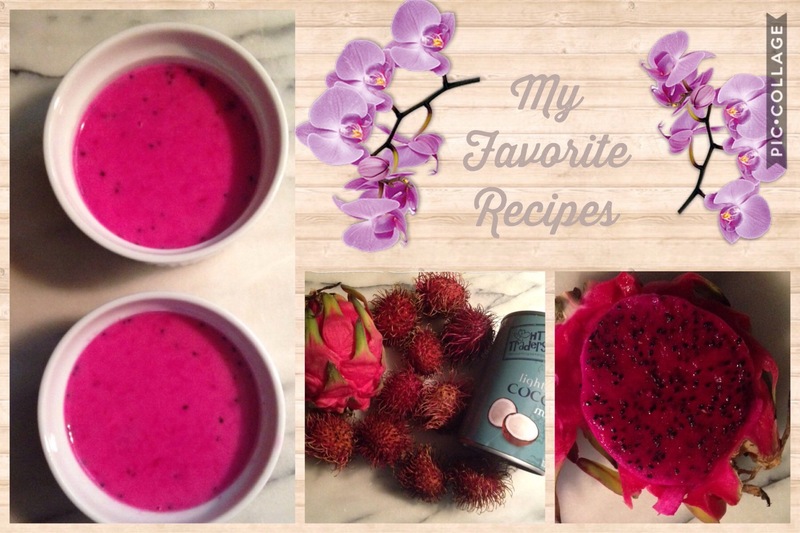 This entry was posted in Breakfast, Cakes and Pastries, Celebrations, Desserts and tagged coconut, coconut milk, Dragon Fruit, Pudding, rambutans by My Favorite Recipes. Bookmark the permalink. Thank you. It is tastes as good as it looks.